The Original Loft Company's Long Single Loft has all the quality Features of all Original Loft Company lofts. 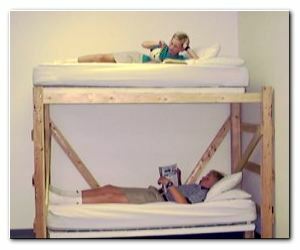 The Long Single Loft is used to loft 1 bed and will fit in all dorm rooms (Room Guide). The Long Single is long enough to fit a second bedframe completely underneath the loft. It can be placed in any position in a dorm room. For size information see the Dimensions page. This loft is ideal for lofting 1 bed in a situation where it is desirable to place a second bedframe completely underneath the loft or where additional room is required under the loft to accommodate long furniture such as a sofa or extra wide futon. The loft has ample space for a large sofa, or extra wide futon, or a writing desk and chair, or a computer desk, or even a TV, refrigerator and microwave. For assembly information see the Kits/Installation Guide. To reserve this loft proceed to the Reservation page.